A woman who wore a “Won’t Be Caught” t-shirt while allegedly stealing handbags from a Florida store has been caught, records show. According to police, Shazonya Williams, 21, and a female accomplice swiped more than $700 in merchandise from a Marshalls store on August 30. Surveillance video captured Williams--wearing the message t-shirt and floral pants--and Lexus Perry fleeing the Sanford business with the handbags. While Perry was arrested days after the theft, Williams remained at large until her collar late last month in Orlando, where she was picked up on a grand theft warrant. Seen at right, Williams, who is locked up in the Orange County jail on $5100 bond, was not wearing the Nike “Won’t Be Caught” garment when cops finally corralled her. Instead, she had on a “Witch” t-shirt. 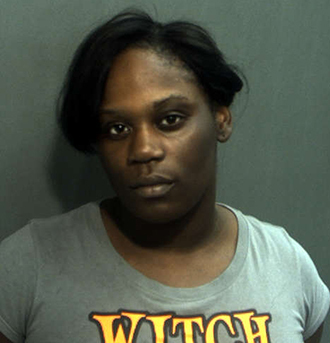 Earlier this year, another Florida woman, Toccara Marlesha Huff, 33, wore a “Won’t Be Caught” t-shirt while she and a sidekick stole $1500 worth of perfume and cologne from a beauty supply store in Tampa. Huff, 33, was arrested two months after the heist and was released from custody on $4000 bond. After Huff failed to show for subsequent court hearings, an arrest warrant was issued for the convicted felon. Huff remained at large for two months before she was caught--and jailed--in early-September.